I’ve been continuing my adventures of “how much can I actually do on my iPad?” The next challenge in my list was blogging. I have a WordPress blog (hosted by WordPress, which means I don’t have access to all the nice add-ons), and I was pleased to discover they had an iOS app. It isn’t too bad — especially for checking comments / notifications, checking website stats, or correcting minor mistakes. However, the editor isn’t great for writing posts. It can definitely do it, but it feels lacklustre. The interface is tired, and you don’t have the full range of formatting options (you can do bullets, numbers, bold, and italic. You can’t do headings). The web interface for writing posts on WordPress is not too bad. I’ve seen numerous complaints that “the old editor was better,” but for me I’m pretty happy with the current one. Except for when I’m on iOS. On a desktop it works well, on iOS it does not. Technically everything works, but highlight a piece of text with your keyboard or start typing and it tends to scroll to a seemingly random location. Don’t bother. The WordPress iOS app is decent overall, and you could certainly write posts on it fairly happily. Basic formatting is available (bold, italics, bullets, numbers). Surprisingly absent is the ability to format paragraphs as being various heading levels. You can preview your post from within the app and add images and links and so forth. I felt the UI for writing posts in the app was a bit dated, and I found the lack of headings bugged me, so I kept on my journey. Note: I have found a solution to headings - if you turn on markdown (see later in this post) for your WordPress blog, then you can use markdown syntax to set headings in your post. However, the in-app preview of your post doesn’t reflect the markdown (you have to go to the web interface for that), so I decided the app had not redeemed itself. There are a few on the app-store. They offer a range of features for managing your blogs across different services. They seem to all stem from a heyday when blog software had not mobile support. Unfortunately, none really seem to have been updated since. Tbh I really didn’t dwell here long, as the interfaces offended me (yes, I’m that vain). My previous posts on Scrivener for iOS (for long form writing) will have revealed to you that I love writing in this app. The question is — can it work as well for writing short-form content such as blog posts as for long form? Scrivener doesn’t have a publish feature. It really isn’t what they do, so I suppose that is ok. You can export your posts in different formats using the iOS share features, so there is a way to easily get your posts out of the app — you just need to get them into your blog. This is where things become less that ideal. I’ve checked a lot of techniques, and the unfortunate answer is there is no perfect way to do this. The best approach I have found is to use another app called “Workflow” which lets you automate all kinds of tasks, including posting to WordPress. You can set up Workflow to receive the rich text from Scrivener via the share command, then prompt you for the post title and other metadata (or default it all) and post the content to your blog for you. This works exceedingly well. Providing your post has nothing but text. If you want formatting in your post (headings, bold, italics, numbering) you need to post to WordPress in markdown. For those who don’t know what markdown is — it is a simple technique for marking formatting in plain text. For instance, surrounding a word in asterix (*) will make it italic when displayed on a blog that supports markdown. Note: If your blog is a WordPress blog hosted by WordPress (on wordpress.com) then markdown is turned off by default. See below for how to turn it on. Write your post in Scrivener. Publish your post to WordPress (as a draft). Load the post in the WordPress web editor, upload any images to the correct spots. 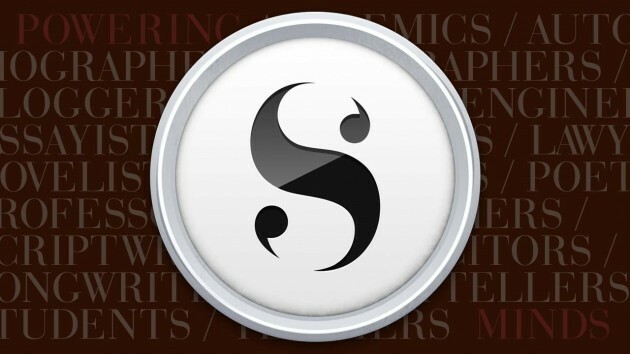 Final verdict: Scrivener provides a great writing environment, but it isn't design for writing markdown -- which you really need to use for getting formatted text into WordPress -- and it doesn't natively publish to WordPress, requiring a third party app. If you are self-hosting, there are various add-ons you can add to your wordpress blog that provide lots of markdown features. However, I’m using wordpress.com, so I can’t use those addons. If you are like me, you can activate markdown support from the hidden wordpress admin console - to get there add /wp-admin to the end of your blog URL (e.g. www.greatblog.com/wp-admin). From here, go “settings > writing” and tick the “Use markdown for posts and pages” checkbox. 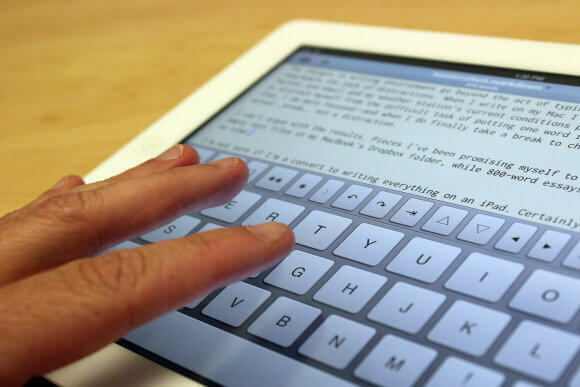 Ulysses is a professional writing app along the lines of Scrivener. It is beautiful and powerful, with the main caveat that it is only on the mac ecosystem (no Windows I’m afraid). Ulysses has recently added the ability to publish natively from the app to WordPress blogs. This is amazing — no third-party workflow app, and it should get everything including images. I haven’t tested it directly yet, but I’ve seen Ulysses in action and I’m impressed. The dsrawback here is that Ulysses isn’t cheap. For Australians it is approx $38 on the appStore. Hands down Ulysses is the best option I’ve found. There are other writing apps that are cheaper, some of which can publish to WordPress (see IA Writer next), but none that provide the seamless experience of Ulysses. However, I’ll admit I’m having trouble justifying the price, especially when IA Writer is 75% cheaper. IA Writer is a text editing app that has been around some time. It has a clean, minimalist interface like Ulysses, and it can sync your work with either iCloud or Dropbox. It is designed for writing in markdown, and that has some advantages -- you can subtle formatting confirmation as you type, and there is a full preview option to see how the result should be rendered. Use the WordPress admin interface (add "/wp-admin" to the end of your blog address) and upload your images to your media gallery. Grab the URL of your image in the gallery. Add the image link to your work using markdown syntax. Ulysses is the best tool I have found for developing and then publishing WordPress blog content for iOS. At almost AUD$40, however, I can't justify buying it just for that purpose. It is a great writing app, and many people use it for short and long-form writing -- if you have it, I recommend using it for your blog as well. For those of us not using Ulysses for our other writing (I'm sticking with Scrivener for now), IA Writer is a good alternative to Ulysses. It is a great markdown text editor, syncs with Dropbox, and publishes to WordPress from within the app. Also, it is a lot cheaper. I recently posted about my first impressions for Scrivener on iOS and how much I love it. I’ve continued my love affair with the software, but have been hitting one issue for which I now have a resolution; the spell-checker language kept using American English. I searched the Scrivener for iOS app settings for a language or dictionary option, but couldn’t find one. I checked the official knowledge base, but there is very little there on the iOS version. Finally, I found a response in the discussion forums that answered my questions. It turns out, the Scrivener spell-checker uses the language dictionary associated with the iOS keyboard selected. 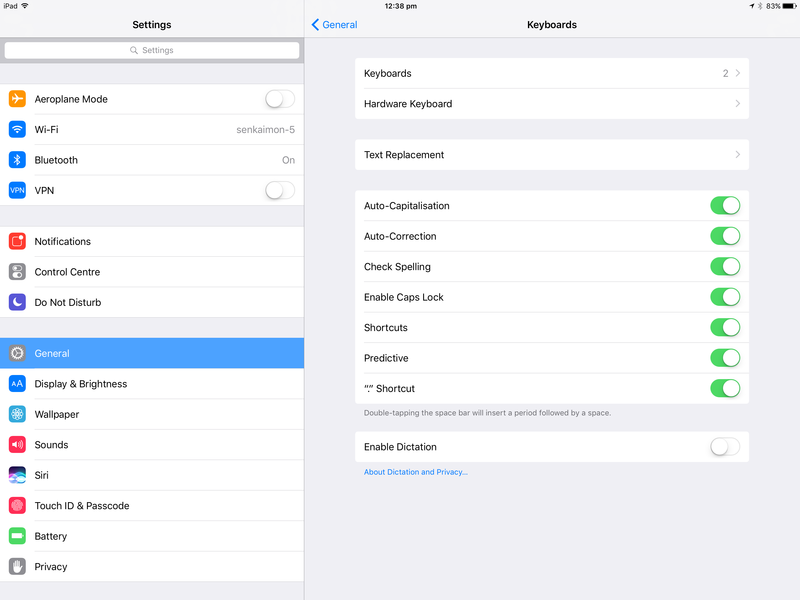 You can find keyboard settings in the settings app under General > Keyboards. Within the keyboards section, there are two places to set the keyboards available: “Keyboards” controls the software keyboards available; “Hardware Keyboard” (as the name suggests) controls the settings for physical keyboards you attach. By default, I had three software keyboards configured; Australian, emoji, and American. I use the Apple keyboard cover, and am constantly pressing the little globe button that changes the language — it seems that act key changing the spellchecker language to American English. I have since deleted the American version and since then the spellchecker appears to be correctly checking against the Australian English dictionary.